We have a ridiculous amount of client reviews for a reason – we offer one of the best couple’s massages in town. Most places just do a regular massage and the biggest difference is that you have two therapists and two clients. So with most places around town there is not anything special about the session. With us, we go out of our way to make your couple massage an EXPERIENCE you will not soon forget. The Ultimate in Relaxation and Pampering – Our therapists are highly-trained and are very detailed in how they deliver massage. 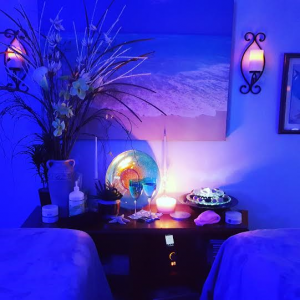 It starts from the moment you enter the massage room because the environment is meticulously decorated and most clients tell us they immediately start to relax. Then the massage tables are super soft and warm, and we use the best bolsters and the fluffiest neck rolls so you actually feel like you are floating on air during your session. Real, Therapeutic Bodywork – We do very purposeful massage therapy in that we deal with areas of pain or discomfort as we work on you. We find out if you have areas of pain or discomfort when you come in and we spend a bit more time on those areas for you. If you are super stressed we will make sure we spend more time doing some relaxation massage and spend a bit more time on your foot massage which directly affects the stress level in your body. Effective But Soothing Deep Tissue – Over the years, I have had way too many clients say they received deep tissue and they would tell me the therapist hurt them or they ended up in pain for days after their session. In our practice we do LEVELS of deep tissue. We do not use more pressure or go any deeper than you can comfortably handle during your session. Effective deep tissue does not have to kill you. We also utilize the warmed stones and warmed stone tools for doing some of the deeper work which is super effective and very soothing to our clients. Healing Hot Stone Therapy – ALL of our sessions contain some level of hot stone therapy. Why? Because one stroke with a warmed stone equals about 4-6 strokes with just our hands. It is JUST that effective. You see the heat of the stones plus the pressure applied with our hands helps muscles to really relax, which allows for more effective bodywork. 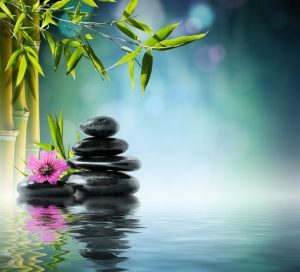 The hot stone therapy also takes relaxation to a whole new level since the heated stones directly affect the parasympathetic nervous system in a way that no other therapy does. The heated stones are also healing and restorative in that they speed up muscle recovery after strenuous exercise or activity. Alternative Music Collections – We offer the usual spa music but we also offer more for our couples who want something a bit romantic. We have several music collections that are various compilations of Old School R&B romantic music. We have the full spectrum of couples coming in from all over the U.S. so we have those who are conservative and who only want the spa music. But more than half of our couples really enjoy our romantic collections so we keep expanding them. The Best Foot Massage In Town – Our foot massage is so good it has a name: Heavenly Foot Massage. It is done with a special therapeutic cream that we make in-house. It includes hand work and work using the warmed stones. There are also some elements of reflexology in it. A foot massage like this increases one’s energy level and is one of the secrets to our clients emerging from a session feeling brand new! If you would like to book a couple’s massage please call or text Donna at (216) 640-6851. We offer daytime, evening, and weekend appointments but everything is done by appointment. No walk-ins. ← Mother’s Day Massage Therapy Sessions!